There are many vegetables that are available year round, but green beans are one vegetable that always seems to be available fresh in our stores, is very versatile and easy to prepare. When I am looking for a quick green side dish to round out my menu, I often choose green beans, though I often prepare them differently. I first blanch my beans in boiling water, drain them, and then drop them into ice water which keeps them crisp and bright green. Just before I want to serve the beans, I heat up a little olive oil with my seasonings of choice, then toss the beans into the oil to flavor them and heat them up. I actually like my beans at room temperature, so I frequently prepare my beans completely ahead of time which makes meal planning just a little bit easier. All peppers are rich in vitamins A, C, and K, but red peppers are rich with them. Antioxidant vitamins A and C help to prevent cell damage, cancer, and diseases related to aging, and they support immune function. They also reduce inflammation like that found in arthritis and asthma. Vitamin K promotes proper blood clotting, strengthens bones, and helps protect cells from oxidative damage. 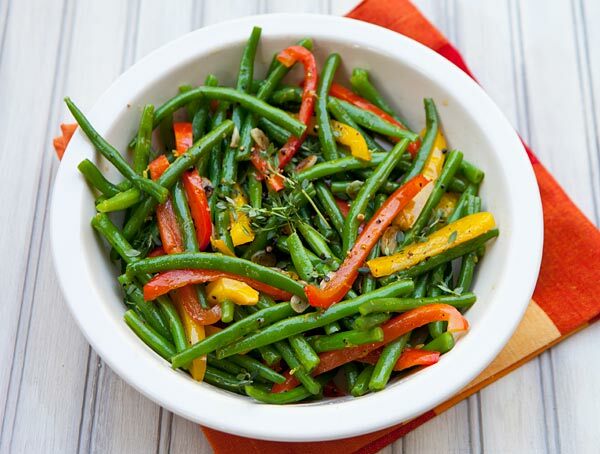 A vibrant bean side dish that would work well with just about any entree. Trim the beans on each end, and then core the peppers, removing the seeds and membranes, and slice thinly. Cook the beans and pepper strips in salted boiling water until tender crisp. Drain, and drop the vegetables in a bowl of ice water and let sit for 10 minutes. Drain beans and dry well. In a wide bottomed pan, heat the olive oil and season with salt, pepper, and red pepper flakes. Add the garlic and cook just until sizzling, then add the beans and peppers. Cook for a minute or two unto the beans are flavored with the oil mixture and are warm. Add the lemon zest and fresh thyme and toss to mix well. Louise, I love the color of your soup! The last couple of days have put me in Fall mood, and I am loonikg forward to the bounty of the season.I always roast my pumpkin and squash for soup, but never tried roasting the onions. What a great idea, and a time-saver, too.I am spoiled from eating in season, fresh, natural apples in Serbia, and the big, perfect, glistening orbs do not appeal to me at all. Give something crispy, crunchy, juicy, a bit green, a bit red, and I am happy. Braeburn and Honeycrisp are my favorites.Great photos, as usual! This looks truly yummy! It’s just what I have been looking for. So I have decided to cook it myself at home.